This is our second visit although last time it was warm and full of activity and this time it was cold and nearly empty in the back areas (the front was full of hearty winter campers). It's a large and well laid-out park with many amenities as well as propane, gas and diesel on site. Water was off but fortunately you could fill up by hose at the office building. All sites are FHU so there is no dump station (when water if off you can flush out with whatever water you pick up when entering). Our site was mostly level but we needed one block front and back on the left. There is a nice large fenced dog park. The staff is friendly and helpful. There is a well-stocked camp store with good coffee, donuts and a variety of other food both hot and packaged. 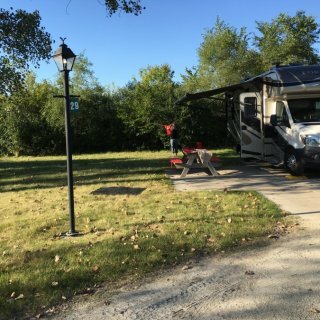 We camped at Waterloo / Lost Island Waterpark KOA in a Motorhome. Fuel up here on arrival or before leaving. Lost Island Waterpark is right next door. We stayed here for one night in a pull-through FHU site. The sites are gravel and can rut so aren't necessarily level. We had to level up one side of the RV. Where we were able to park with our RV + towed car, we couldn't reach the sewer connection so in the morning we had to go around and pull closer before dumping out. 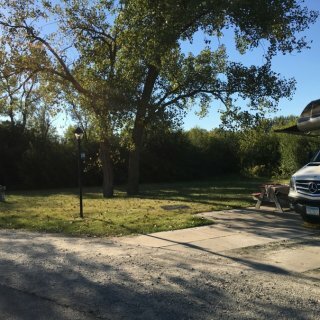 We reserved online by the KOA app and arrived after hours to find that the posted rate the the campground was lower, however in the morning they said they couldn't adjust the rate since we reserved online. What? Why don't they use their "real" rates online with KOA? The dog walking area is right along the major roadway and isn't fenced (if there's a fenced area back in the trees somewhere, I didn't find it). It appears to have a nice pool and playground for when the weather is warmer. Call for reservation to make sure the online rate isn't above their on-site rate. 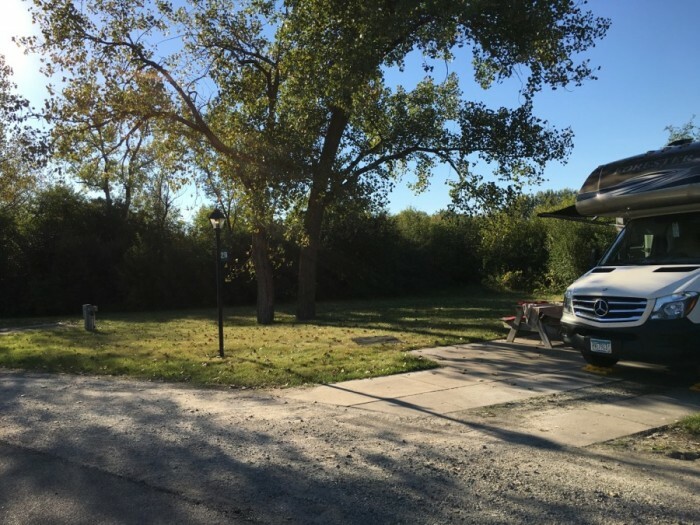 We camped at Rock Island / Quad Cities KOA in a Motorhome. After trying the state park and finding it lovely but up on a big hill and basically closed (no water, but electricity is on), we drove over to this camp. It's a surprisingly nice find. It's a Community of Christ camp facility, but they do not even ask about your religion. It's a large camp with many cabins and a large athletic field (great for dogs), among other things. But they only have maybe 10 RV sites. The sites are very good though - long concrete pads, pull-through with FHU, and very level (what a relief after so many campgrounds that weren't). If there isn't incoming traffic, they will let you leave your RV on site for the day while you go sightseeing in Nauvoo. The roads to the park are narrow but passable and there are some potholes in the driveway so just take it slow. We camped at Camp Nauvoo in a Motorhome. Spend a day to three days visiting historic Nauvoo! This park is loaded with amenities, especially for kids. It has a well-stocked store and a good size fenced dog park. However, the basic infrastructure for the park is old and in need of repair. Our biggest concern on arrival was that the sites are obviously not level. Our guide assured us once we pulled into our site, we would find it perfectly level. Well, it wasn't. It took 3 blocks under each front wheel to get level, which is quite a lift. Other spots were downright hilly or had large humps or dips in them. The bathrooms and showers were superficially clean, but the air vents are frightening and the floor drains are rusty. The men's shower had no shelf for soap/shampoo in the shower and only 1 of 2 had a bench to sit and put on socks and shoes. One women's room was closed for remodeling so hopefully they are re-doing all of them. They did have water on at the sites but no water at the dump station. They said it was "closed" and should have had cones - but it didn't. They said I could use a FHU site but at this point I already had the hose hooked up and was ready to go. So - I posted a "NO WATER" sign at the dump station for them to warn the next guy. This park need work. We camped at St. Louis West / Historic Route 66 KOA in a Motorhome. This is really a nice urban park. If only more cities had parks like this! It is well laid out with very large sites, pull-thru and back-ins available, FHU, no cable but ample local OTA channels, friendly front office help. It's located right on the river bank (sea wall) and immediately adjacent to a pedestrian bridge to the Clinton Presidential Library that is also connected to the 15-mile Little Rock Trail. The bridges have beautiful lights at night which together with the reflections of the city lights make for a very beautiful scene! Expect urban noise from the nearby interstate and airplanes - not that bad really. We camped at Downtown Riverside RV Park in a Motorhome. There is ample RV parking at the Clinton Presidential Library if you stop there on your way in or out. Also if you need a place to park after checking out, there are boat trailer parking spaces at the public launch right next door which may be open. Just don't turn down the ramp! It's really very good for what it is, at least for a traveler - a convenient stop-off with good, full hookups and friendly service. Several people live there - it's like America's smallest small town! But they have one pull-through and several back-in sites available for transients. It's family owned and the owners are working to improve it each year. Gravel roads and sites which are nice and level. Surprisingly good WiFi compared to many more established sites we have visited. 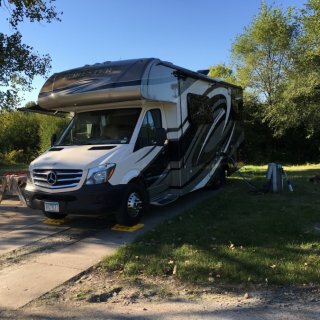 We camped at Almost Home RV Park in a Motorhome. Call Steve for availability and a reservation. Stop short inside to make sure you pull into the right area. Inside navigation is OK but with little margin for erroneous maneuvers. Very good place to stay while sightseeing. We stayed four nights. Nothing fancy and it's an urban campground so there is plenty of street and airplane noise (12-1:30 am and 4-5 am FedEx every week day) and no campfires. But good sites and hookups, plenty of pull-thrus, clean facilities, good 5-machine laundry (we used them all and what a time saver! ), and friendly helpful office staff. No fenced dog yard but a VERY large walk area where you can throw a ball a long way! WiFi is typically weak to nonexistent when everyone uses it, as at most parks we visit. No cable but many over the air local stations. We camped at Graceland RV Park & Campground in a Motorhome. Get ribs at Marlowe's with 10% coupon from office and take-out Chinese from Hong Kong, both just down the street. All spaces are pull-thru and FHU so this is big rig paradise. However the sites are uneven gravel and close. The bathroom was really smelly and the shower looked cold and uninviting. The laundry machines worked OK but the building was dirty and there was no folding counter and the machine tops had to be washed before putting clean clothes on them. There was no screen door so it was full of mosquitos. There are a few old wrecks stored on the site taking usable spaces (why?). Truck noise starts nearby early each work day. As others have noted, there is no woods. There is no dog park but ample walking area. The staff is friendly and helpful and the site is convenient in-out and for visiting Montgomery. 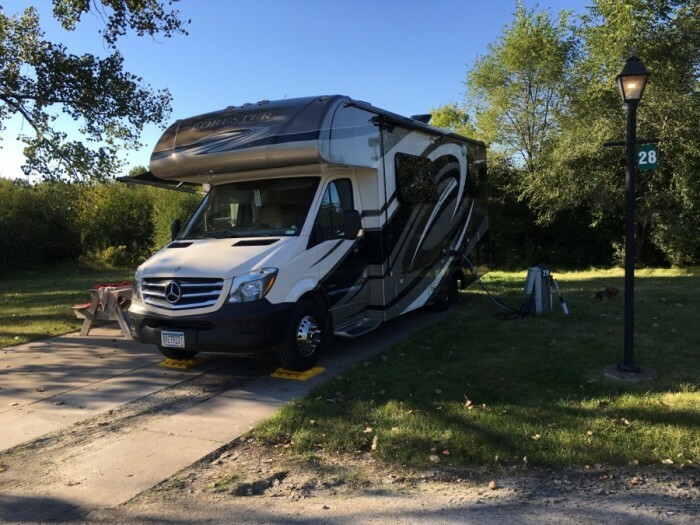 We camped at The Woods RV Park and Campground LLC in a Motorhome. A very nice and large park with endless options of things to do. We took B-19, a very nice end drive-thru that was mostly level and ample room for our road. The park was not full so we had plenty of room. It's just sad to drive miles into the park and then find all the campsites crammed together in one area. It's good for visiting Birmingham but quite a long drive in and out each time. We didn't use the shower or bath facilities. W/E is cheaper than FHU and age 62+ ask for the senior discount. Fri melt staff at the gate and camp store. We camped at Oak Mountain State Park in a Motorhome. Definitely a mixed bag. Mostly long term, working folks with a few transient spots. Nice clean new showers and laundry. Sites are a little tight and there is a surplus of mud when it rains. But is is very peaceful and quiet at night (except for train whistles in the distance). Tucked into a residential area with narrow but navigable streets to get in and out. Call for reservations - don't bother with the web site form, it won't be answered. Friendly staff though when you call. Quite expensive for what you get but supply is quite limit near Atlanta. We stayed 3 nights. We camped at Sweetwater Creek RV Reserve in a Motorhome. See King Center, Jimmy Carter presidential library, CNN tour, World of Coca-Cola, tons to do. An excellent park overall. Typical of COE, it is we designed and built. Sites are spacious and level. Electric and water hookups work well. There is an abundance of facilities including a boat ramp, multiple boat docks where you can tie up your boat, multiple playgrounds, multiple bath houses, water overlooks, a sports court, etc. Almost all the sites are on the water. There are five pull through sites (2, 24-26 and 36), of which only 36 is on the water side. The bathrooms and showers are OK, but they really need to get a power washer in there and just clean the heck out of it. The playground equipment also needs power washing. The gate staff was friendly and helpful. 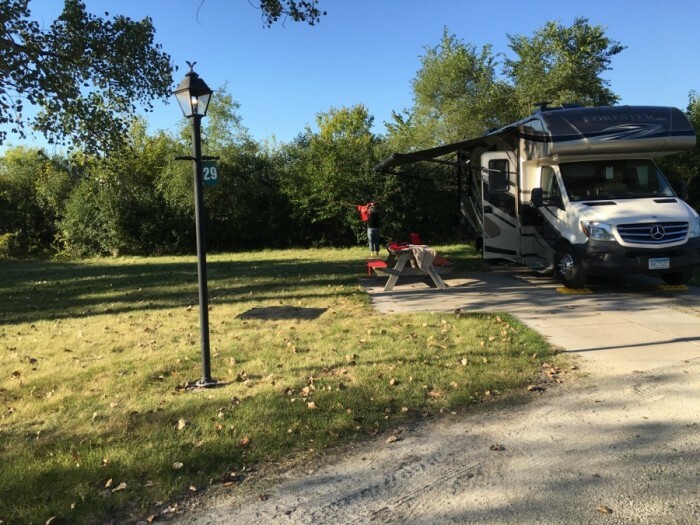 We camped at Prairie Creek COE in a Motorhome. If bringing a boat, try to get a site near one of the "courtesy docks." Similar to other comments, the park is a bit run down and quite overpriced. The entry road has a lot of potholes and the short-stay pull-through slabs are completely crumbling and not level (yet somehow usable). Electric and water hookups were OK but the sewer was too far back to use without going around again (we can't backup with our toad), so we paid for FHU but really got partial. WiFi was very weak and there is no cable but a few over the air channels are available. The office staff was very helpful. There is a nice new smallish fenced dog yard (but don't throw the ball too hard or it will go way down in the hollow!). There is a water slide that was not open yet but looks to need a lot of cleaning. There is a noisy road nearby but the park actually gets very quiet at night. Early in the morning, noisy activity starts at the metal scrap yard across the road (they pile up and crush cars). It is satisfactory for an overnight stay but overpriced. We camped at Meridian East / Toomsuba KOA in a Motorhome. The park is a nice location but it is low and subject to flooding. We can't blame the park for near historic rainfalls before and on the day we arrived. However, even the non-flooded areas had mud and large standing puddles. The park isn't graded well and there doesn't seem to have much grass or other vegetation (maybe we just couldn't see them with all the flooding?). We had picked site 11 but it was a muddy mess so we called the ranger and asked to move to 12 but he moved us to 19 which was OK but he didn't change it in the system. The next day we had to take the RV for service and even though we left orange cones across the site entrance and our door mat there, someone took (or was given) the site. Ended OK as we took another site. The site pads are very short and you may not get more than one axle on them so be prepared. Electric and water hookups are OK. The dump station is adequate but the water hose had a hole in it which I tried to fix with duct tape. Note that multiple sites are monthly only; only a few are nightly. (Even with flooding, the ranger wouldn't let us use the empty monthly sites.) If several sites are available, it would be better to pick in person than online. We camped at LeFleurs Bluff State Park in a Motorhome. This park is all about location, several blocks from the French Quarter making it an easy walk or bike ride. However you cannot walk back at night (the park even advises against it) due to security - take a cab, Uber or Lyft back. The park itself is fine but not outstanding. The sites are long, wide and reasonably spaced. The roadway is wide and easy to navigate. There is a bit grass for each site and a couple of small common areas of grass but no dog park and a scarcity of trees and fire plugs. A big disappointment is that WiFi is in common areas only - crazy for such a small park. The laundry is good and clean with 3W and 3D. The bathrooms and showers are OK but could be nicer and certainly could be cleaner. The grounds are very clean with curbside trash collection throughout the day. The pool is cold (Feb.) but the hot tub was hot although it had mediocre jets. Security is good: it is fully walled and the front entrance is gated with a code. You are basically parked in a walled compound within the city. Hookups are good including cable but the sewer in our site was far away and required pulling up before leaving. All sites are back-in with ample room for parking a car/truck. Police, fire and ambulance sirens run nearly continuously throughout the night and day as does I20 - bring ear plugs! There is a nice fitness center. The staff is very friendly and most helpful. We would recommend this park for visiting the FQ but don't expect a luxury resort. You are paying mainly for the location and security. 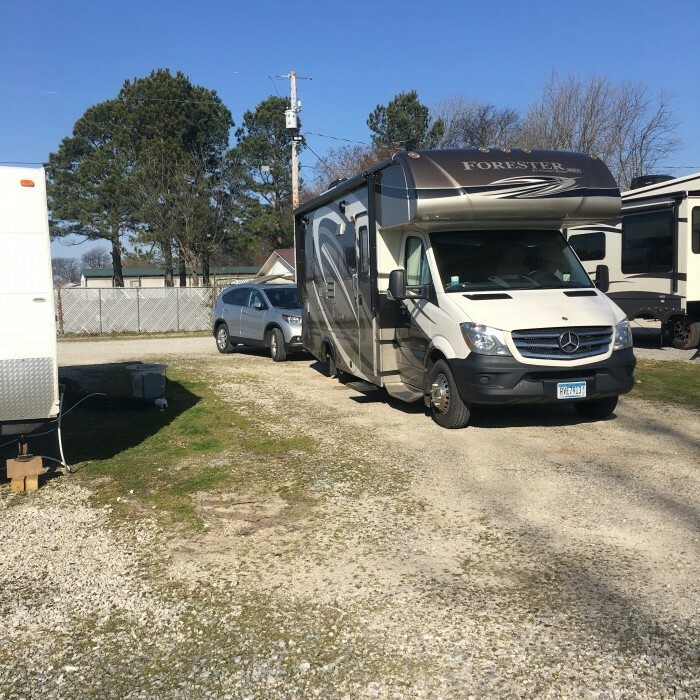 We camped at French Quarter RV Resort in a Motorhome. Get to Preservation Hall 45 minutes before show time to wait for open seating. It's well worth the wait! We stayed here one night in a pull-through site while passing through Baton Rouge to New Orleans. Our site was not quite long enough for our 25' motorhome plus towed small car but other sites nearby were larger. The park is meticulously maintained. Repairs and landscaping cleanup were active while were there. The front desk staff was very friendly and helpful. The price seems high especially for off-season when the pool is closed. But it was nice to stay is such a well-cared site. We camped at Baton Rouge KOA in a Motorhome.